Video conferencing is a great way to communicate. While not everyone has the capabilities over half of Americans have some sort of mobile device that has the capabilities to download and app to video conference, and the majority of the other half can conduct their video conferencing through their work or home computers. This year(2013) will see a lot more use of the video conferencing type of calling, and below is a list of the top 5 Android apps that will help to provide video conferencing on a mobile device. 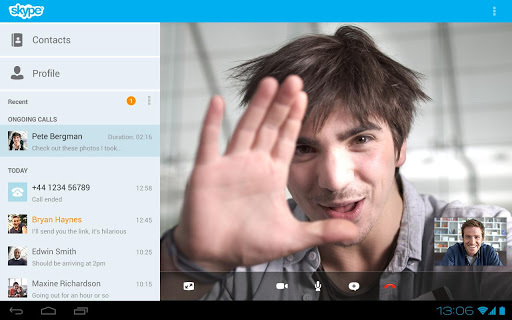 Skype is probably one of the most well known video conferencing apps on the market. ooVoo continues to make updates to their products in order to ensure that they stay toward the top of that list too. ooVoo actually offers certain free features with their app that Skype charges in order to acquire. Multiple person video chatting happens to be one of those features. You are limited to chatting with only 4 people while using the multiple person video chatting section, but it is still more than what is offered on the free version of Skype. Skype only loses out to Facetime in the rankings for best Video chat application. While the main reason people love Facetime is that it has a concise clear picture, if is free to Apple users, and it is extremely easy to use. Unfortunately you are only able to speak with other iOS users. There is not cross platform application, and that is where Skype trumps Facetime. Skype works across multiple platforms in order to ensure that no matter where you are or what device that you are using you just simply have to download the Skype app and you will be on your way to communicating in no time. Qik is a great option for video chatting, but the main focus of the program was not actually for the video chatting section. It was created in order to be able to easily share videos. That is why the video chatting add-on was so easy to adapt. If you share a lot of videos this would be the perfect software for you. Fring tries extremely hard to compete with Skype. While it does a very good job by undercutting some of Skype’s pricing it falls short in other areas. Fring is a strictly mobile application. You cannot download it to your home computer, so if you wanted to relax and set it up on your laptop you will be out of luck. This is a major setback to most people for they would have to have a separate type of software if they want to communicate through their home computer. Most of the other aspects are pretty comparable, so hopefully they will get wise to developing a plug-in for the PC or Mac platform. ClearSea wanted to setup an entire network where it would be extremely easy to communicate with specific individuals. These networks do not need to download the software for they have all of the properties that you need in order to communicate via video chat. You do not need to worry if you are not on the network for you can just simply download that app and get to work. ClearSea does not have anywhere need the popularity that apps like Skype or ooVoo have established, but do not count them out quite yet. Video chatting is a fun and entertaining way to communicate. There is no reason that you should not be able see a friend of family member’s face simply because you might not be near each other. Video chatting is the wave of the future, and we will only be seeing further advancements in this category in 2013.